In recent years, the industry has seen a dramatic increase in the number of architects and designers who specify cast stone. What factors are driving this upward trend? 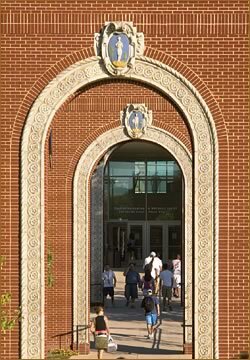 Roscoe L West Library, Ewing, N.J.
Photo courtesy of Advanced Cast Stone. Some may argue that it’s the beautiful design detail being incorporated into architectural plans for new and renovated buildings. After all, cast stone opens up more options for architects, designers and owners to leave their unique marks on projects. Others have postulated that it’s the increased demand for buildings, city centers and marketplaces designed to reflect the culture and individuality of the areas where they are constructed. Cast stone is perhaps the most effective and efficient material to achieve this goal as well. All these points are advantages for choosing cast stone over natural stone, but which three are the major drivers for architects in the United States? To find the answer, I reviewed hundreds of masonry jobs my company has completed in the past few years, and identified three key decision factors: Cost Savings, Design Flexibility and Reliable Manufacturing Standards. Mercantile Bank Building, Fort Worth, Texas. In our experience, architects who specify cast stone for the first time are surprised at the cost benefit when compared with natural stone. On projects with which we’ve been involved, cast stone saved between 40 percent and 50 percent on material costs alone. 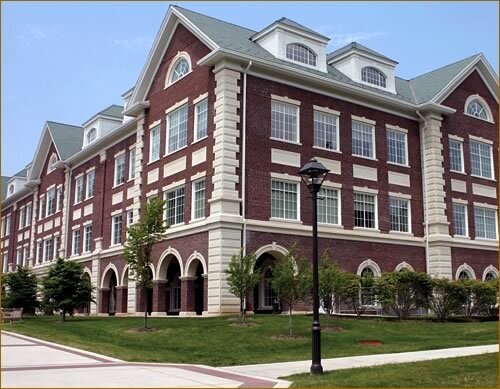 While the masonry costs were similar to natural stone, the cost savings on materials, coupled with the significant savings on product lead-time, provided architects critical advantages on their projects. Particularly in recent economic times, budget constraints have imposed challenges on architects to deliver exceptional design without exceptionally high costs. This has created an even greater demand for alternative materials, and cast stone has become the product of choice over natural stone and carved stone, including brownstone and travertine. In the past, cast stone was mainly known as the choice material for colonial, traditional or federal style structures, but in recent years, cast stone has been used to enhance a range of designs, both on the exteriors and interiors of buildings. Why? 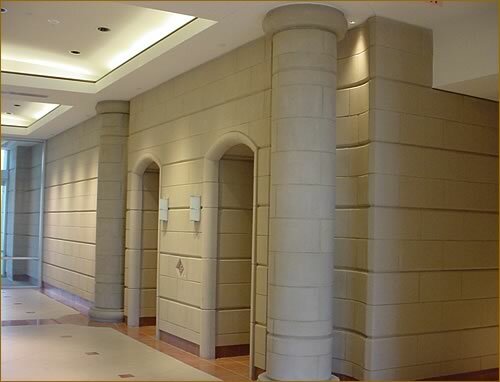 Design flexibility is one of the major reasons architects specify cast stone. Natural stone is not only expensive to work with, but has design limitations. The nature of cast stone enables the material to be molded into virtually any shape. This is a huge advantage because you can faithfully reproduce new designs for your project. If you are matching existing stone on a building, cast stone enables you to produce replicas of natural stone designs, which are indistinguishable from the original. In working with design possibilities on your projects, choose a manufacturer that can build a cooperative working relationship with you and the mason contractor on the project. In our experience, a thorough review of the manufacturer’s shop drawings is important to the success of the cast stone portion of the project. Before you choose a cast stone manufacturer, be sure to ask if the company is willing to work with the architect and mason to make sure special attachments are detailed, that lifting eyes or other assists are provided and that movement of product at the job site are given adequate consideration. One other consideration: As the architect on a project, it may be beneficial to you to bring in the manufacturer early in the process to determine if certain designs may be difficult to produce. Laura Lee Blanton Building at Southern Methodist University, Dallas, Texas. Consistency of product is important in almost every industry, and this is particularly true with construction. 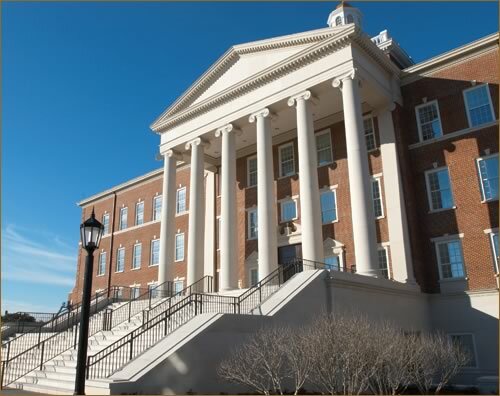 To ensure consistently high manufacturing standards, two, independent organizations oversee the quality of cast stone manufacturers: the Cast Stone Institute (CSI) and the Architectural Precast Association (APA). Firewheel Town Center, Garland, Texas. When you choose a member manufacturer of either organization, then you know that the cast stone plant you are working with meets specific key requirements. You can be confident that certified plants produce products to ASTM specifications. Members must have detailed, written operating manuals and they are required to pass inspections of their plants by independent quality-control firms (on random and unscheduled bases). This certification of compliance to high quality standards is a strong reason to choose a cast stone manufacturer that maintains membership in at least one of the oversight organizations. Cast stone has been produced for a very long time, which is why building owners are confident that the product will withstand long-term aging. What you may not be aware of is the number of advances that have been made in the cast stone industry in recent years. Newer and evolving computer software programs can now extend supplement CAD designs. While these programs cannot replace the artisan’s eye, they do help speed the mold process and enhance precision. In the production area, certified cast stone manufacturers now incorporate a wide variety of materials to form molds that enhance production capabilities and accuracy of molded parts. In addition, new and improved admixtures are helping resolve past issues with cementaous products. By adding new material to batch design, manufacturers like us have increased both strength and absorption. In today’s economy, architects are responding to the demand for high-quality design and materials on a strict budget by incorporating cast stone into their plans. If you have not looked at cast stone recently, this would be an advantageous time to compare costs, design flexibility and manufacturing standards for materials to achieve your project goals. Eddie Lesok is CEO of Advanced Cast Stone, Inc., an award-winning national cast stone manufacturer. ACS has earned certifications from CSI, APA and MCAA. If you have any questions about cast stone, please contact the company at genes@advancedcaststone.com. 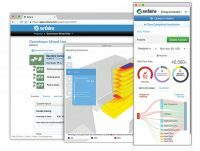 Sefaira has launched a major upgrade to Sefaira Architecture, cloud-based software that enables project teams to design high-performance buildings by helping them understand their energy use, environmental impact and occupant experience. As Cast Stone Prices Fall, Will Quality Suffer?